The question should Valencia coach Unai Emery be sacked has been floating around for few weeks now and especially after Valencia lost their match to Villarreal and consequentially got out of the Copa Del Rey cup. In this article I'm going to follow Valencia CF coach Unai Emery spell with Valencia from the start to now and draw some conclusions how's he done and should he be replaced. 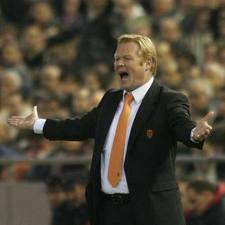 Going back to the season 2007-08 Valencia was playing fairly well and than came the sacking of coach Quique Sanchez Flores and the appointment of new coach Ronald Koeman, who left PSV to join Valencia. This was supposed to be a match made in haven, only in turned out it was a match made in hell as Koeman broke the relationship with many Valencia veterans, made constant first team changes and Valencia was in the relegation zone and fighting to survive. The only thing that came out from the season was the surprise Copa Del Rey trophy. Koeman was fired before the end of the season and was replaced with Valencia intern Voro who lead Valencia to 10th place finish. 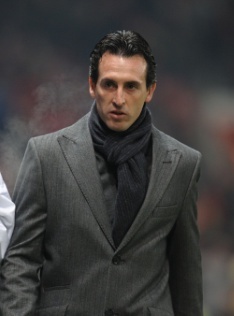 Unai Emery was then the coach of Almeria who after guiding it to promotion in the first division finished 8th in the table with the average Almeria and was highly regarded. This caught the attention of Valencia board and Unai Emery was brought on a two year deal. This is how the journey of Unai Emery started with Valencia. With Unai Emery now firmly at the helm the team made a terrific start to the league and was first in the standings for few matches. Valencia got beat by Barcelona to the leader spot and when the storm calmed Valencia was doing good enough, but not great. Then all of a sudden the ship started sinking and Valencia started performing poorly one and a half to two months before the Christmas break. This problem would not turn out Emery's fault as the team announced a huge debt of 400 to 500 million euros and the players were not even receiving their salary. The main people in the club at that time tried to calm down the players, media and fans and they announced that payment is going to continue normally in two months. For those two months Valencia visibly performed bad and lost a lot of ground in the championship. Emery's first season and he faced huge problems with players not getting payed and mounting pressure from all sides as Valencia's future was not even certain at that point. He had to work with the youthful Mata, the emerging Silva and with shattered spirits of the remaining veterans at Valencia. Somehow amid all the chaos Unai Emery managed to regulate the sporting department and steer the club slowly but steadily to 6th place finish in the standings and allowed Valencia to go to the Uefa cup. The season was hard and conditions were bad, the club was in meltdown, but the players with Emery at the helm managed to get to the respectable 6th place finish, an incredible feature if you ask me at that point in time, with Mata playing his best season than looking from this point of time and the continuity of several of Valencia's veterans int the next season. The season 2009-10 started and now with a presidents change and new board and high spirits in the sporting department with the securing of Villa and Silva stay after a ton of speculation about their future at the club. Few new players were brought in also, mostly cheap ones or on free transfer such as Moya, Dealbert, Mathieu and Bruno. In the preseason Valencia had some very interesting training sessions that were fun and yet demanding with a good mixture of physical and technical training. Valencia started the season with bad defense and people were calling out the coach for the defensive errors. Unai Emery reacted and replaced the goalkeeper Moya with Cezar Sanchez, as well as the defensive pairing and the results started coming and the defense was good for the most part. After winning most of its matches and going into an unbeaten run of few matches the media started calling Valencia a title contender to Barca and R. Madrid and pressure started mounting on the players and coach and much like last season Valencia good results came to a grueling stop. Clearly the coach methods and training sessions were working and Valencia was able to achieve a good start, but the players were not stable enough to continue in their best form. Nevertheless Valencia continued well and apart from Barca and R. Madrid was the best of the rest. Into Emery's second season on the winter break and Valencia began to be considered as a top team in Spain again and you can tell from the reaction of many of the coaches before their matches vs Valencia, where they were making all the excuses for a possible loss before the match was even played. Banega who was to be let go after drinking and staying late too much became a different person and player under the guidance of Emery. In fact he became so good that he was irreplaceable in the midfield and helped guide Valencia to 3rd position in the league. Valencia also had a bit of luck in the signing of Cezar Sanchez as he would prove to be a mountain on the goal and single-handendly won Valencia several matches. Valencia didn't perform as good in the Copa Del Rey going out to Atletico Madrid and also failed to go a long way in the Uefa cup, but it was playing really well in La Liga and finished 3rd with 71 points that in older times would have probably won Valencia the title. Unai Emery reached the clubs objectives for qualifying into the Champions League and his contract was extended for one year. The 2010-11 would see the likes of David Villa and David Silva leave, but Valencia used that money to purchase some new players with the likes of Soldado, Tino Costa and Aduriz. The preseason was once again great as they started with low exercises to gain fitness and gradually progressed into more physical training sessions. There were also the fun training session that had the players in nature and jumping and climbing and riding on ropes on the trees. With so many players leaving and coming Emery requested as much friendlies as possible to get the squad gel and in peak condition for the start of the league. Emery got what he requested and Valencia played 8 matches in which was surprisingly poor. The problem was found in the 4-3-3 formation that Emery was trying to implement and after going to the more familiar 4-2-3-1 the results came against Fiorentina and Lecce. Valencia started the campaign with an unbeaten run of several matches and once again same as the two seasons before was great in the start only to get into a bad run of results after the 5th or 6th match. The rest of this season you know and yesterday was the last match of the first half of the season with Valencia currently at 4th position, 2 points behind 3rd placed Villarreal. So what conclusions can we draw here and can we really call Emery a bad or a good coach? The answer is very complex and probably not even possible, but what we can draw from all this is that Unai Emery has done some pretty amazing things in some of the conditions he has worked under. Imagine Jose Mourinho coming to Valencia and than finding out the players are not even taking their salary, the club future in shatters and all talk is about the financial situation and not the sporting one. Would Jose Mourinho been able to get a broken team in every regard that fought for survival last season and make it function enough to finish at 6th place? We will never know, but I'd imagine most coaches would have been lucky to avoid relegation again, let alone fight for going out of Spain and playing in some of the European cups. We can call Emery's first season at Valencia a total success, regardless if someone else could have achieved more or less. 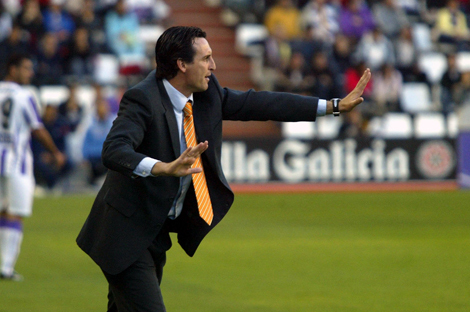 Emery's second season at Valencia was also a success. Going back even just several seasons now and those 71 points could have won you the title in Spain, but with the form and way Barcelona has been playing winning the league is right now probably impossible even for R. Madrid a team full of stars and previous best players in world awards. Valencia's current season with Unai Emery so far is also a success. Valencia finished half the season with only 2 less points than the previous season and with the likes of Villa and Silva gone. I can't tell how good or bad our players are, because those opinions are based on how the team performs and their individual performances. All I know is that Aduriz and Soldado are not on the level of David Villa and Tino Costa, Feghuoli and/or Dominguez are not on the same level as David Silva. If Valencia president Llorente thinks even the slightest like me this season Emery is as safe as anyone can possibly be. If Valencia also reach their season objectives at the end I fail to see why Valencia should risk getting a new coach and having the possibility of another Koeman happening. 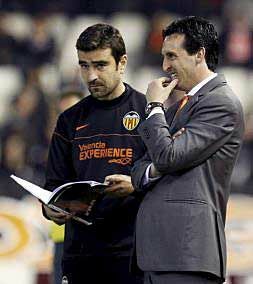 If Valencia reaches its objective this season I think Valencia should extend Emery's contract by another year, if Valencia fail to qualify for the Champions League though, then it would be another story and Valencia should consider its options with different coaches.